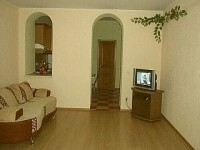 Studio apartment 30 $ / Yalta / 9 , Dmitriev Str. A luxury 1-room apartment updated up to western standard. Air-conditioning. Satellite TV. Private green yard. 5 min walk to the sea front. Studio apartment 30 $ / Yalta / 2 , Ekaterininska Str. Sea view studio apartment at a fair price. Only 50 m to the sea. Air-conditioning. A luxury studio in a superb location, right at the sea front, on the main pedestrian promenade of Yalta. Air-conditioning. Quiet, lovely backyard. 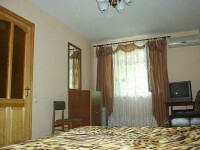 Studio apartment 30 $ / Yalta / 16 , Gogol Str. A nice, freshly renovated and tastefully decorated studio is situated near the Oreanda Hotel. Five minute walk to the sea. Air-conditioning. Studio apartment 30 $ / Yalta / 11/2 , Karl Marx Str. A freshly renovated studio in the centre of Yalta. There is a private outdoor patio. Air-conditioning. Three minute walk to the sea. A decent choice at a fairly reasonable price!